Painting the Cabin — O'Day Mariner #1922 "Orion"
One of the first tasks I performed after buying the boat was painting the walls of the cabin, and it made a tremendous difference right off the bat. The walls were peeling paint, especially around the portlights. Here are some pictures - you'll see what I mean. After emptying the cabin, I sanded everything with an orbital sander (5"), a sanding block and a folded up piece of sandpaper, all 120-grit. 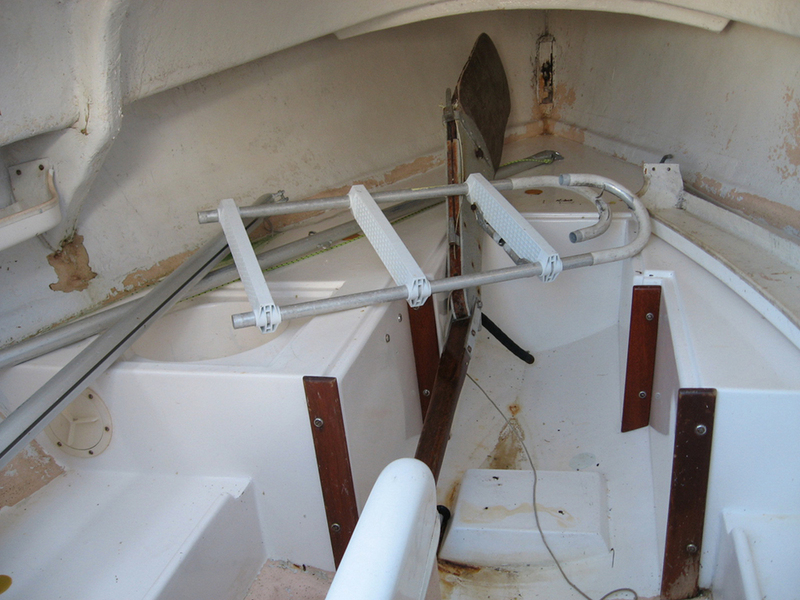 I started on one side and worked my way around to the next side, reaching back almost to the transom. What a job - it took four hours. My arms were killing me and I was tired of banging my head on everything. It was important to get off all the flaking paint - I just left the stubborn paint where it was and just sanded the heck out of it. I was able to get back pretty far by laying on my back on the quarter berths and actually painting upside-down with my arms outstretched. Not a comfortable position, but it worked. In the meantime, the paint I decided on was Pettit Dura-White #3121 - it's now called "EZ Cabin-Coat". It's mildew-resistant, and it's possible to have it tinted any color. Taking advantage of that feature, I decided to have the interior color matching the exterior color - a light green. It's just a nice color, and I wanted to try something other than white. I bought two quarts - just the right amount, as I eventually found out - and had them both tinted at Benjamin Moore for a whopping $5.00. That's all it cost, since they only charged me the cost of the tint. • Use a good respirator - not just one of those dust masks. This stuff stinks of ammonia when it's going on - much like Kilz. After all, they're both very similar products. My respirator didn't quite have a tight fit over my face because of my beard, and I felt a little funny for a short time after I got out of the boat. Not good. Once dry, though, the paint doesn't smell at all. It's great stuff. • Wear a paint suit that has a hood to cover your head. I didn't have one that had a hood, and after squeezing myself into the quarter berths to paint all the way back to the transom, I ended up having to get a hair cut the following day. No joke. • Have plenty of paper towels handy to wipe up and spills and drips. • It helps to have a fan going to get the fumes out of the boat. • Bring a radio - you'll be in there for a while. If you have any questions, just let me know! It was certainly a task worth doing, and it should last for a very long time. You'll be very happy, especially if you plan on cruising for a weekend.